Focaccia is an Italian bread that can be topped lightly or substantially, or used as sandwich bread. Its popularity in North America has resulted in overly simplified recipes using prepared pizza dough. I like Peter Reinhart’s recipe from his very well-rated book, The Bread Baker’s Apprentice. Although it is a 1 to 2 day process (most of the time spent rising the dough), it is well worth the effort. My family couldn’t get over how good this bread was. I had extra sun dried tomatoes after making warm wild mushroom salad (recipe here), so I used them for focaccia. 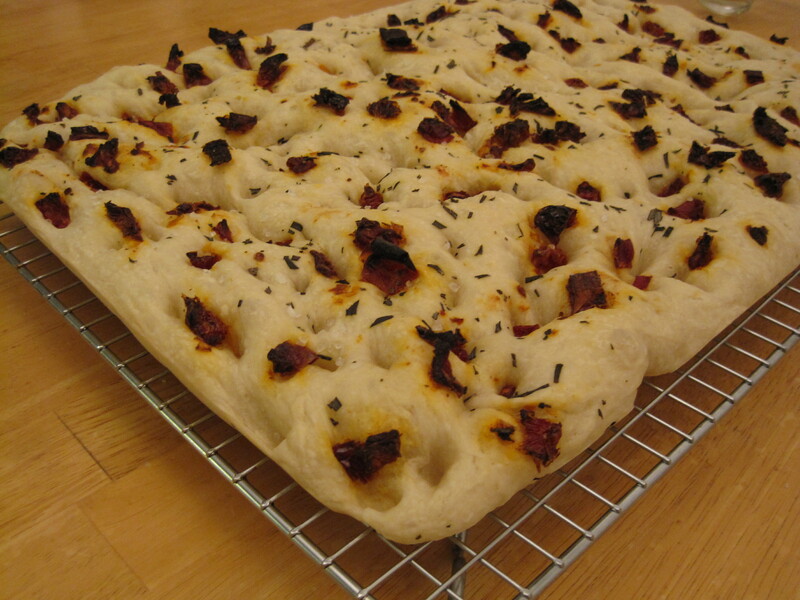 See my herbed focaccia recipe here. adapted from Peter Reinhart’s The Bread Baker’s Apprentice; Note: The original recipe called for instant yeast. I have adapted the recipe for active dry yeast. In a large bowl, mix together the warm water, dry yeast, and sugar. Let it sit for a few minutes, undisturbed, for the yeast to activate. Then, using a wooden spoon, mix in the bread flour until all of the flour is moist. The dough will be soft, sticky, and thick. Cover the bowl with plastic wrap and leave at room temperature to ferment for about 4 hours. It will look bubbly and foamy when done. Then leave it in the refrigerator until 1 hour before you are ready to use it. Or, if your house is cool at night, you can leave it out in a dark space. In the bowl of a stand mixer, mix together the warm water, salt, sugar, and yeast. Allow it to sit for 10 minutes. Then add the flour, oil, and poolish. Using the paddle attachment, mix on low speed until everything is well combined. You will have a wet, sticky dough. Then use the dough hook attachment and mix on medium speed until your dough becomes smooth. Mix for at least 5 minutes before adding more flour or water as needed to achieve a dough that clears the sides of the bowl but still sticks to the bottom. Generously dust a large, clean work surface with flour. Use a dough scraper or a plastic spatula to transfer the dough from the bowl to your work surface. Generously dust the top of the dough and gently pat the dough down into the shape of a rectangle. See photo below. 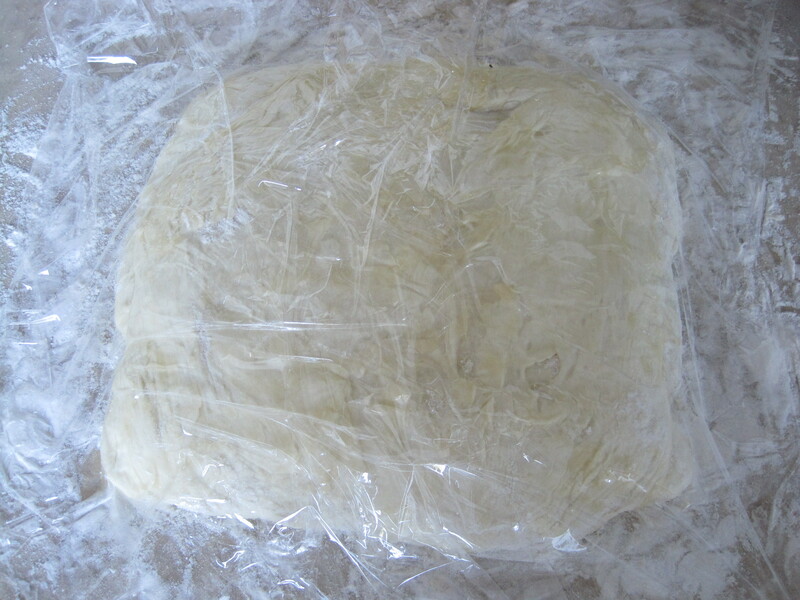 Cover loosely with plastic wrap and allow it to rest for 5 minutes. 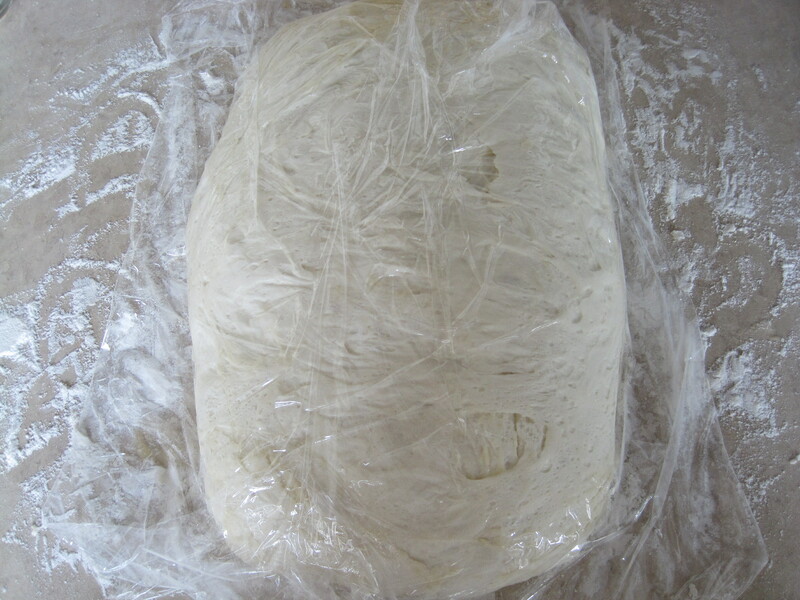 Working quickly, use your hands to lift the left side of the dough, while stretching it by about 50%, and fold it over itself. See photo below on the left. 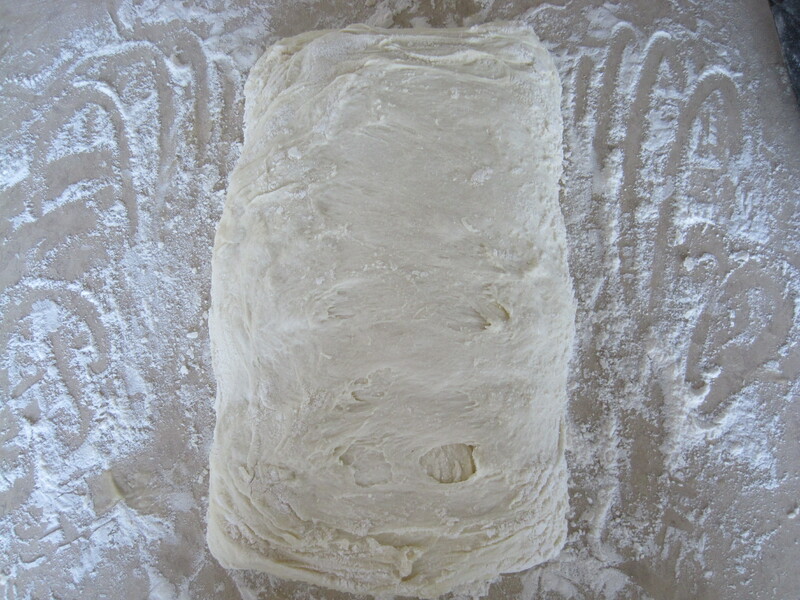 Then, working quickly, lift the right side of the dough, stretch it out by about 50%, and fold it over the first fold. See photo below on the right. Your dough should still be in the shape of a rectangle. Spray or brush lightly with olive oil, dust lightly with flour, and cover loosely with a large piece of plastic wrap. Sprinkle your work surface with more flour as needed. Allow to rest for 30 minutes. 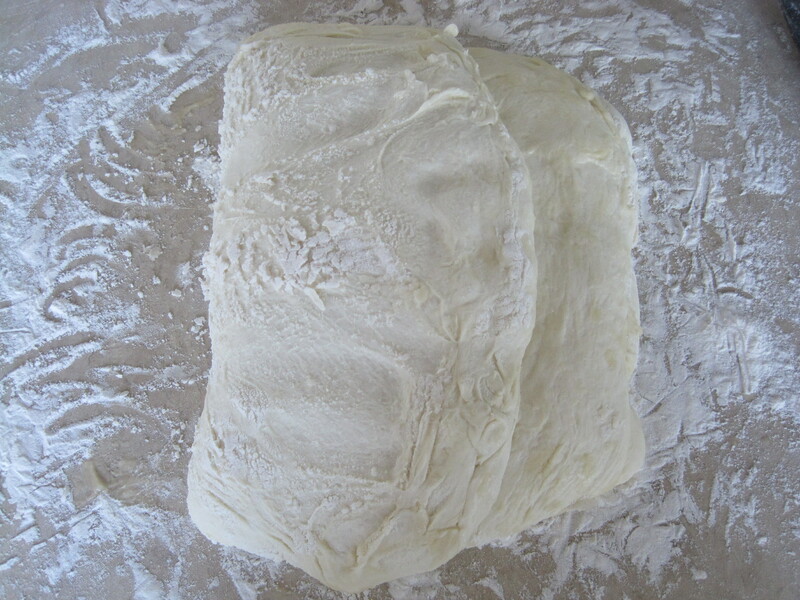 Repeat the steps of stretching and folding the dough as described above. But this time, instead of folding it in from the left and right sides, fold it top down and bottom up. Allow it to rest for 30 minutes. The dough will become easier to work with. Repeat the stretching and folding steps from the left and right sides one more time. Allow it to rest for 1 hour. It will rise, but it won’t necesarily double in size. See photo below. Line a sheet pan (17 inch x 12 inch) with a silpat (silicone) mat or a sheet of parchment paper. Then transfer the dough onto the baking sheet, moving quickly. See photo below. Brush the dough with olive oil. Sprinkle over half of the chopped sun dried tomatoes and half of the rosemary. Use all of your finger tips (not your thumbs) to dimple the dough. 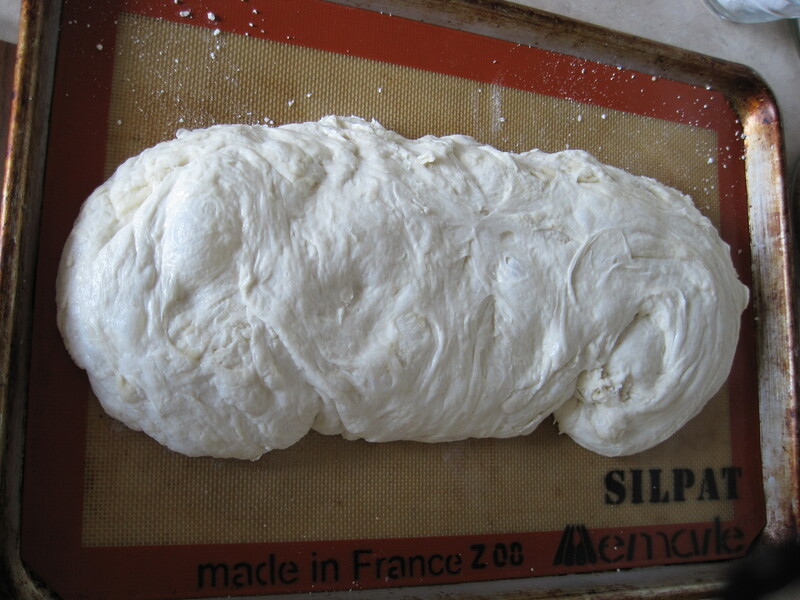 Start in the middle of the dough, creating a line with your fingers down the length of the dough. Push your fingers into the dough to create the dimples and work your way outwards as you dimple the dough and gently spread it outwards to roughly fill the pan. Make sure that you are not tearing or flattening the dough. Dimpling the toppings into the dough prevents burning. Add the rest of the sun dried tomatoes and rosemary as the dough fills the pan to make sure that they are spread out. 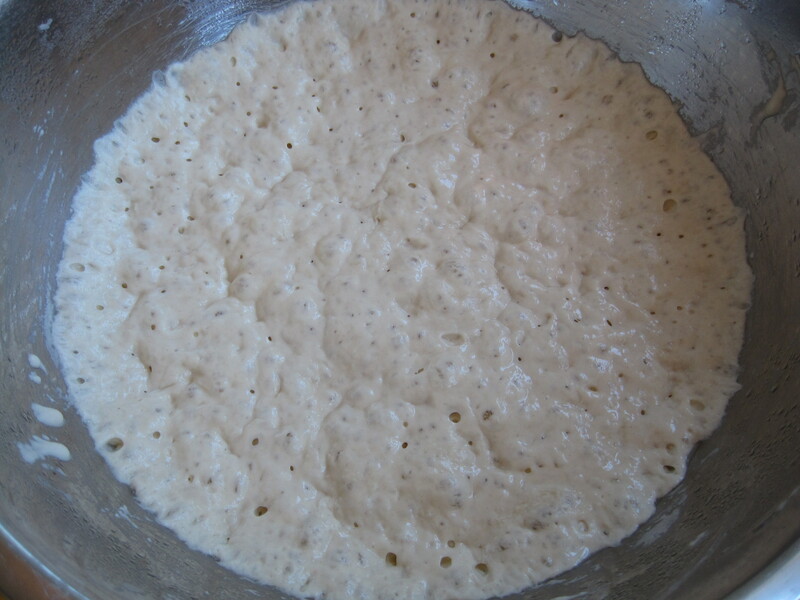 The dough should be an even thickness throughout. Cover loosely with plastic wrap and proof (ie. rest to obtain the desired lightness/texture) at room temperature for 2 hours. 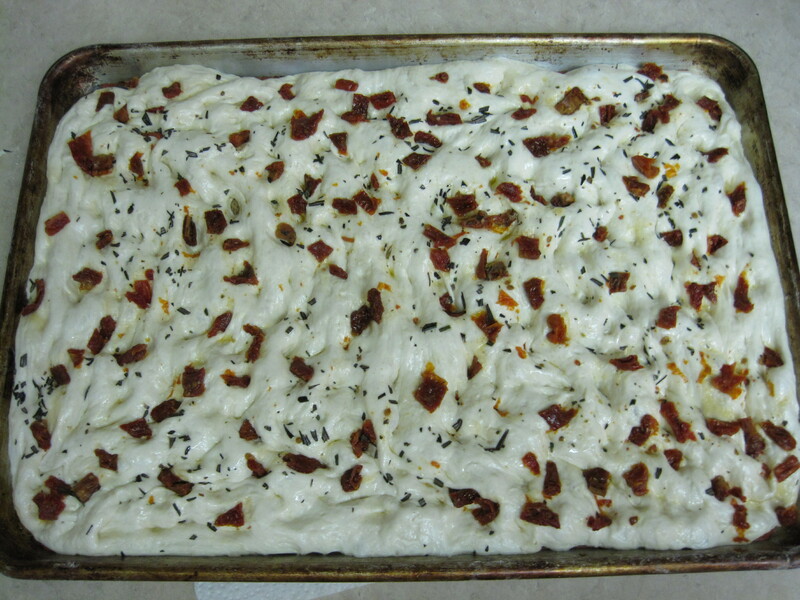 For pictures of these steps (shaping the focaccia), see page 162 (available on google books). Fifteen minutes before the end of the proofing time, sprinkle with coarse sea salt. The dough should have a thickness of 1 inch. Preheat the oven to 500 F. Place the pan into the middle of the oven and immediately turn the heat down to 450 F. Bake for 10 minutes and rotate the pan 180 degrees. Bake for 5 to 10 more minutes until the top is a light golden brown colour. When the focaccia is done baking, immediately transfer it from the sheet pan to a wire cooling rack. Allow to cool for at least 15 minutes before slicing. You can enjoy this as is or with additional toppings. You could also slice your focaccia in half and use it for sandwiches.